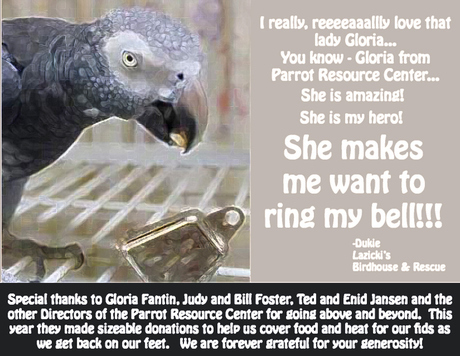 Lazicki’s Bird House and Rescue wanted to do a HUGE shout out and Thank You to Gloria Fantin and Parrot Resource Centre for their support over this past winter. Through the amazing effort of Gloria Fantin and the Board of Directors, she was able to procure donations of over $600.00 for our heating bill as well as another $1000.00 in food and toys for our birds. Currently, under the management of a board of trustees, we want to reach out and recognize and thank the folk at PRC once again for all they did for us at a critical time. It was because of their generosity and help we were able to get on our feet while Steve Lazicki was recuperating from a serious illness.